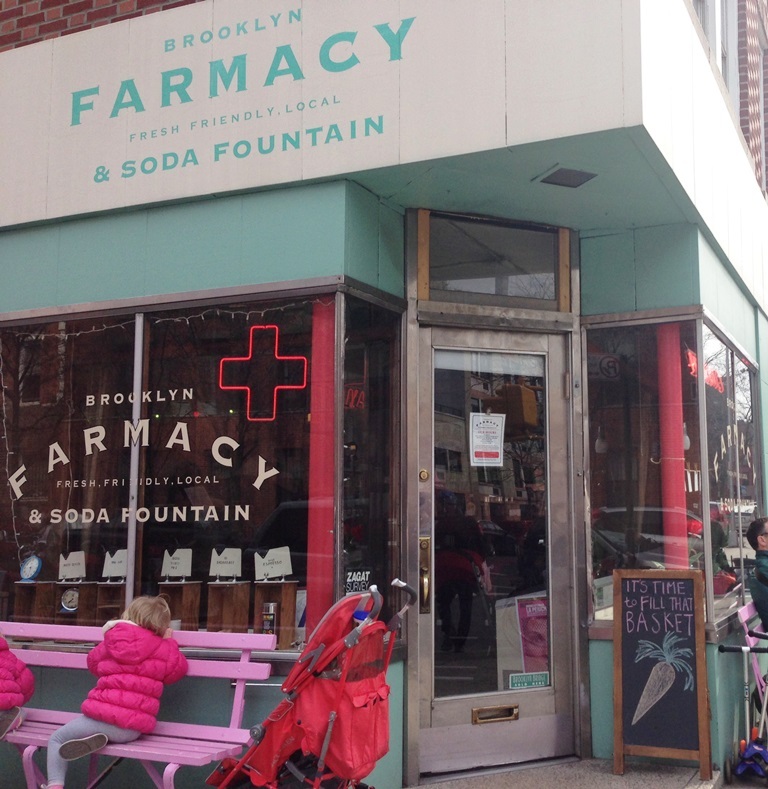 My first visit to Brooklyn Farmacy was a bit stressful. Later, when I consulted with friends, colleagues, the random subway rider, they all already seemed to know what I didn’t. The story would start like this. “I finally went to Brooklyn Farmacy.” Good so far. Then the bomb, “…On a Sunday afternoon.” That’s when the looks would start. Shock, horror, disgust. Apparently I was the only one in Brooklyn, maybe the whole tri-state area, who didn’t know that Brooklyn Farmacy’s throw back soda shop/diner setting unofficially transformed into a playground on the weekend. Once you got past the kids running around, no parents in sight, the occasional crying because the wrong ice cream topping was selected and weeding through the endless sea of strollers, things were great. Just blocking out those experiences added a bit of stress. But I’m not being fair. The last thing I want to do is turn you off of a great dessert (and lunch!) spot based on my poor decision making. No matter where you dine, there’s an unspoken code that can determine the fate of your dining experience. Get to brunch at 11am on a Saturday or Sunday and you’re golden, though might be denied a cocktail before noon. Arrive at the more standard 1 or 2pm and you’re going to wait along with the rest of Brooklyn for a table. Show up at a more upscale restaurant slightly under-dressed and you’ll still get served, but there’s a high chance you’ll be seated in the corner, away from the more beautiful guests, so as not taint their dining experience. Service might be just a little bit slower and a little less friendly. Dining at a shellfish restaurant, even though you’re highly allergic, automatically retracts your right to complain about the limited non-shellfish options. You just need to be prepared when dining. 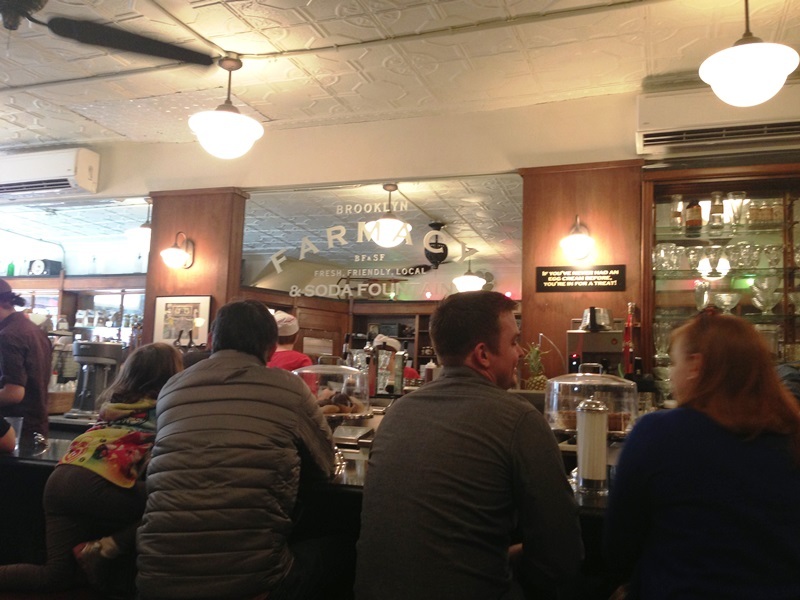 I later went to Brooklyn Farmacy on a weekday afternoon and couldn’t be happier. It was quiet, peaceful and the perfect day to catch up over a coffee soda. And, while not a kid person (probably the farthest from), if a craving hit, I’d absolutely battle the swarms of children to satisfy my sundae fix. I already had high expectations heading to Brooklyn Farmacy. Generally that means I’m let down, but Brooklyn Farmacy didn’t disappoint. As a kid, I never drank soda. I used to think it was the carbonation that bothered me, but when I got older, I had no problem with beer or any other alcoholic carbonated beverages. I think I was just smart enough to know traditional soda wasn’t good. But artisan sodas–that’s something I can get behind. 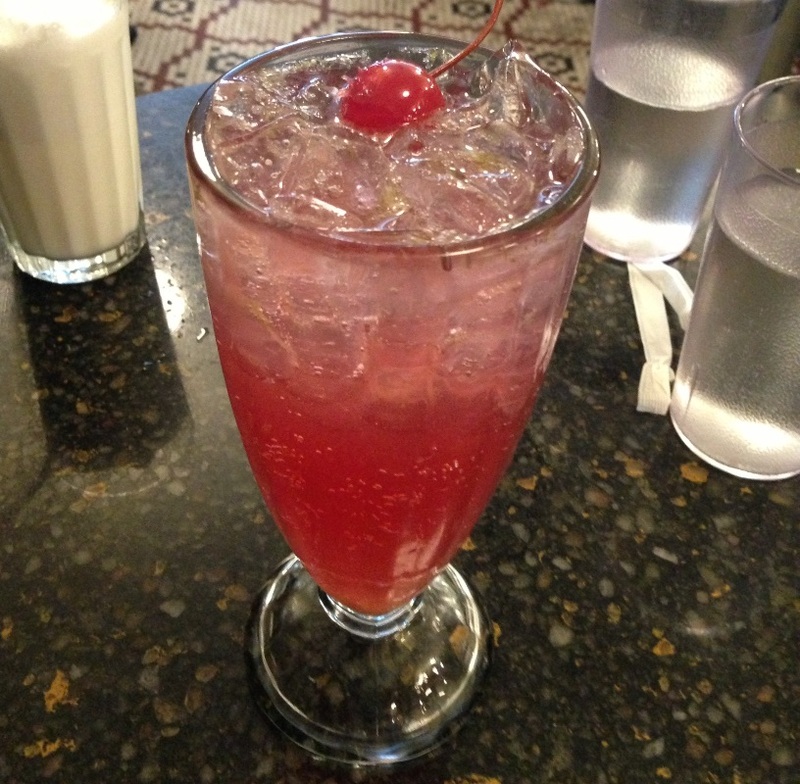 Brooklyn Farmacy had a great selection, made the old fashion way: flavored syrup mixed with soda water. While they have seasonal flavors that rotate, I highly recommend the coffee soda. 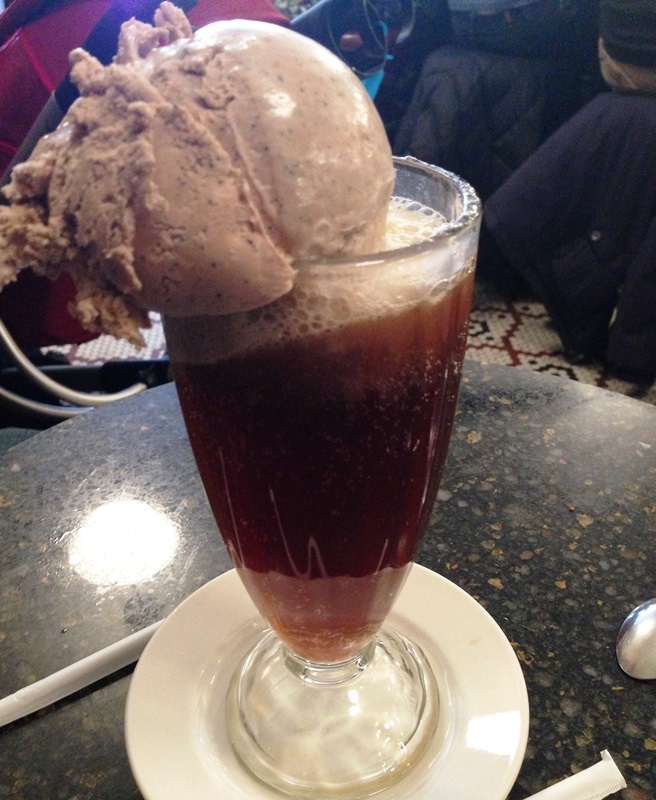 Even better, make it a float with a scoop of Adirondack Creamery ice cream. I should warn you though, their floats are not for the faint of heart and are best shared. When the waiter set it down in front of us, there was an unspoken, “Ready, set, GO!” as we dove in before the scoops threatened to topple over. There are standards you expect at a soda shop. Floats? Check. Ice cream sundaes and banana splits? Check. 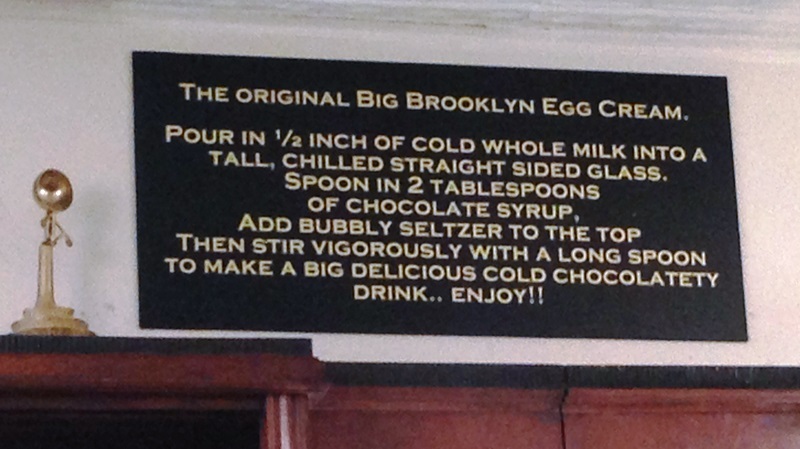 The ultimate egg cream (in vanilla, chocolate, coffee, maple or butter beer)? DOUBLE CHECK! 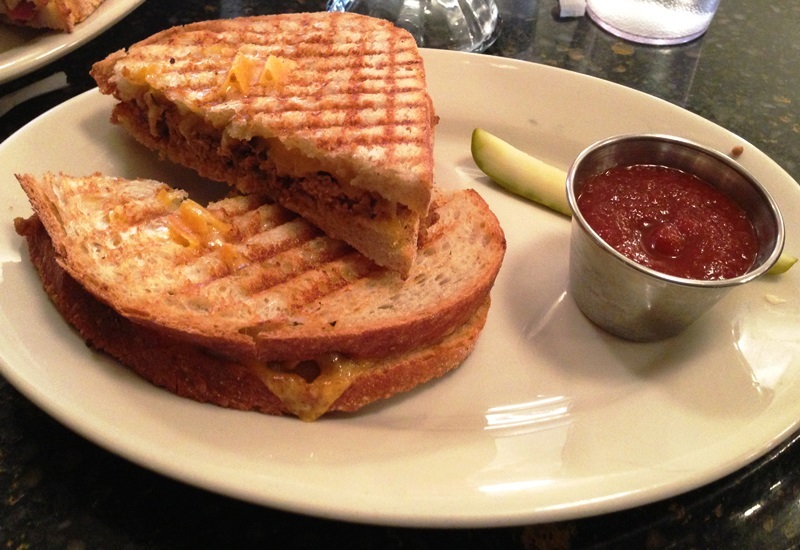 What I didn’t expect was Brooklyn Farmacy’s ability to equally satisfy a savory craving as well. It’s kitchen area was more of corner of the soda bar, complete with a small food prep space, griddle and some Panini presses. But with what they can do with that tiny space–it makes me rethink a lot of seemingly necessary gadgets I have cluttering my kitchen. There was no way I was going to turn down Mama’s Meatloaf Sandwich served with fried onions, cheddar and ketchup on multigrain bread. There were a few other contenders including the grilled ham and cheese and even the classic, yet essential PB & J. For those not yet ready to admit their day is half over, Brooklyn Farmacy serves brunch favorites until 5pm every day. Swing by Brooklyn Farmacy for lunch or a late ice cream treat after a movie at Cobble Hill Cinemas and you’re in the clear. But if your sundae craving hits on a weekend, don’t say I didn’t warn you. Love soda fountain spots, the food sounds really good and now I know not to go on a Sunday afternoon. Now I really want an egg cream. Love the review and the pictures and I’m pining this to remember to go here. Thanks! Definitely recommend it…on a weekday of course. I have gone many times and always had a great experience.Peanut butter and jelly sandwiches are delicious. The fresh ice cream..to die for! I definitely need to try the PB&J next time. I don’t know if I could go for just the ice cream–all the float and sundae options are just too tempting!